Scale (CES-D) (Radloff, 1977), a brief depression screening questionnaire, as a part of their clinic visit. the integration of primary healthcare and behavioral health consultation services are presented. vich, & Seligman, 2002; Cote et al., 2003; Kessler et al., 2001). more detrimental psychosocial outcomes later in life. Caucasians (Wight, Aneshensel, Botticello, & Sepúlveda, 2005). cating accurate assessment and diagnosis. stressful environmental risk factors (Anderson & Mayes, 2010). al., 2005; US Department of Health and Human Services, 2001). males was related to feelings of being stigmatized by their peers. health services (Lindsey et al., 2010). them, thereby the individual seems to be a victim of a homicide. suicide and suicidal behaviors (Boyd & Foley, 2009). 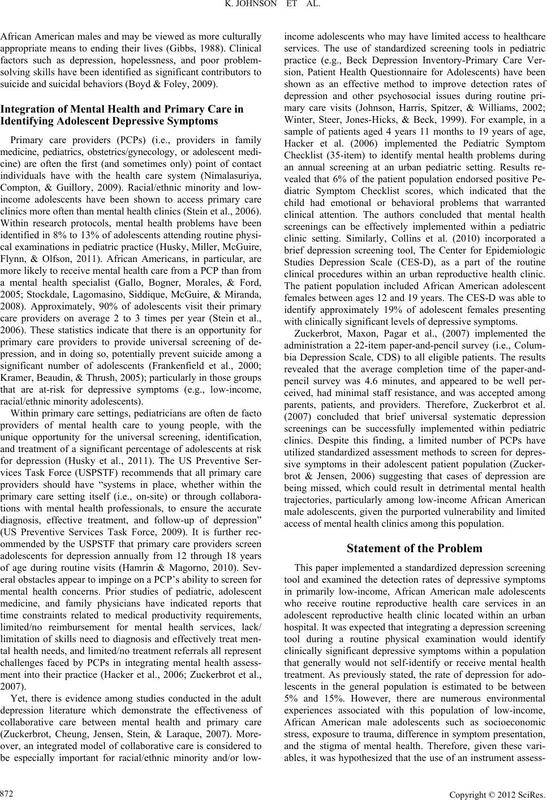 clinics more often than mental health clinics (Stein et al., 2006). clinical procedures within an urban reproductive health clinic. with clinically significant levels of depressive symptoms. parents, patients, and providers. Therefore, Zuckerbrot et al. access of mental health clinics among this population. greater rate than that of the general adolescent population. the same as the abovementioned study. 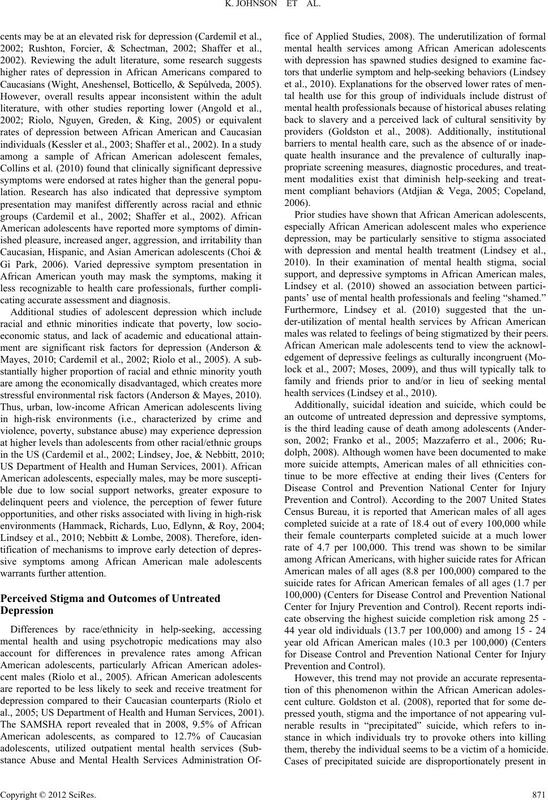 African American, low income adolescent males and females. male adolescent clinic visits annually, of which 20% are males. to an additional item that assessed for suicidal ideation (SI). shown to be valid and to have good test-retest reliability (.77 - .92). better off dead or had thoughts of hurting myself”. (score of 16 or higher) with a mean score of 23.67 (SD = 6.28). reported for adolescents ages 13 to 18 years old (5% - 15%). another form of serious depression should it continue for long. identify themselves as being in need of mental health treatment. Elevated depression scores repor t on the C ES-D among the subsample (n = 9). (Frankenfield et a l., 2000). depression were not obtained or incorporated. sion symptom presentation which are more socially acceptable. 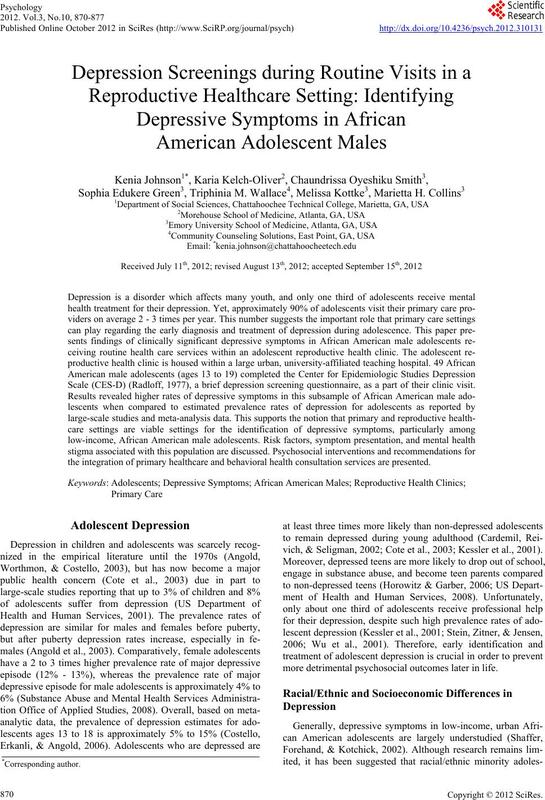 American male adolescent population is especially essential. symptoms in adolescents is only a start to addressing this issue. (Asarnow et al., 2005; Johnson et al., 2002; Walker et al., 2002). American Medical Association, 293, 311-319.
chiatrists. Psychiatric Services, 56, 1600-1602. Bower, P., Garralda, E., Kramer, T., Harrington, R., & Sibbald, B.
school students. Prevention & Treatment, 5, 1-28. L., & Baker, S. P. (2000). Adolescent patients—Healthy or hurting? and white young adult women. 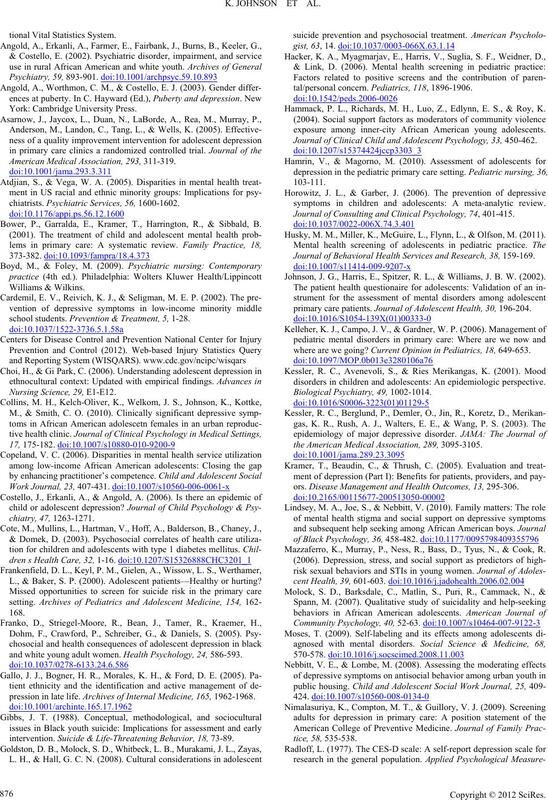 Health Psychology, 24, 586- 593.
pression in late life. Archives of Internal Medicine, 16 5 , 1962-1968.
intervention. Suicide & Life-Threatening Behavior, 18, 73-89.
tal/personal concern. Pediatrics, 118, 1896-1906. Hammack, P. L., Richards, M. H., Luo, Z., Edlynn, E. S., & Roy, K.
exposure among inner-city African American young adolescents. 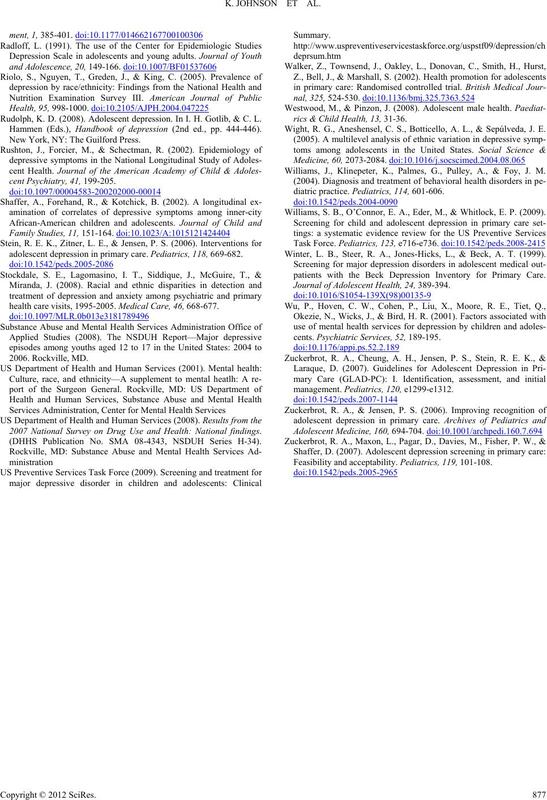 Journal of Clinical Child and Adolescent Psychology, 33, 450-462.
symptoms in children and adolescents: A meta-analytic review. Journal of Consulting and Cl in i c al Psychology, 74, 401-415. Husky, M. M., Miller, K., McGuire, L., Flynn, L., & Olfson, M. (2011). 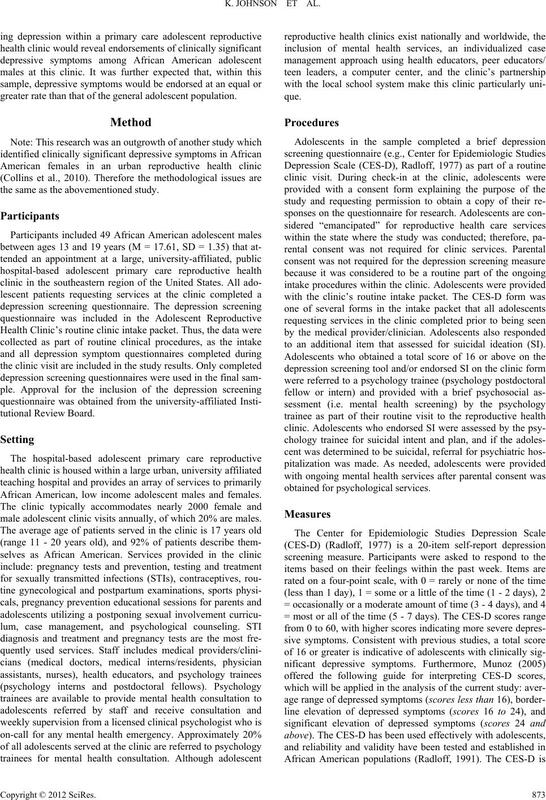 Journal of Behavioral Health S er v ic es an d Research, 38, 159- 169. Johnson, J. G., Harris, E., Spitzer, R. L., & Williams, J. B. W. (2002). primary care patients. Jour n a l o f Adolescent Health, 30, 196-204.
where are we going? Current O pi nion in Pediatrics, 18, 649-653.
disorders in children and adolescents: An epidemiologic perspective. the American Medical Association, 289, 3095-3105.
ors. Disease Management a n d H e a lt h O u t c o m es , 13, 295-306. Mazzaferro, K., Murray, P., Ness, R., Bass, D., Tyus, N., & Cook, R.
Rudolph, K. D. (2008). Adolescent depression. In I. H. Gotlib, & C. L.
Hammen (Eds. ), Handbook of depression (2nd ed., pp. 444-446). New York, NY: The Guilford Press. 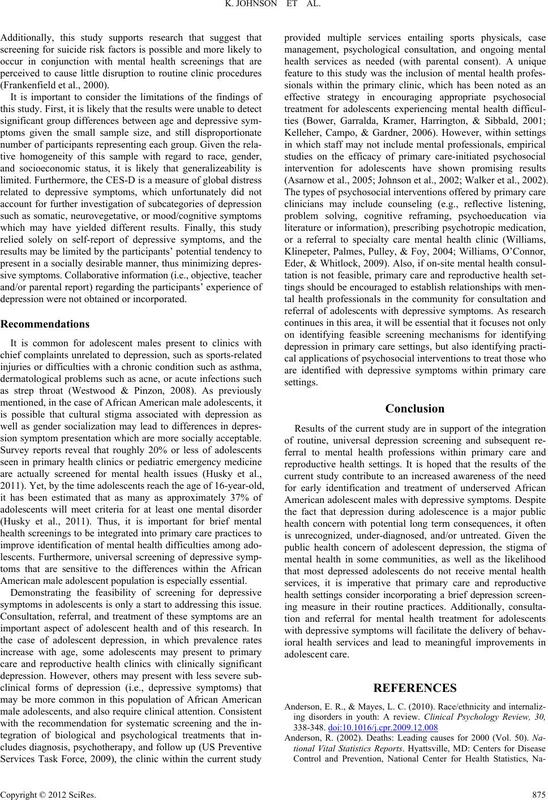 adolescent depression in primary care. Pediatrics, 118, 669-682.
health care visits, 1995-2005. M e d ic a l C a re , 46, 668-677. 2007 National Survey on Drug Use and Health: National findings. (DHHS Publication No. SMA 08-4343, NSDUH Series H-34). rics & Child Health, 13, 31-36. Wight, R. G., Aneshensel, C. S., Botticello, A. L., & Sepúlveda, J. E.
Williams, J., Klinepeter, K., Palmes, G., Pulley, A., & Foy, J. M.
diatric practice. Pediatrics, 114, 601- 606. Williams, S. B., O’Connor, E. A., Eder, M., & Whitlock, E. P. (2009). Winter, L. B., Steer, R. A., Jones-Hicks, L., & Beck, A. T. (1999). patients with the Beck Depression Inventory for Primary Care. 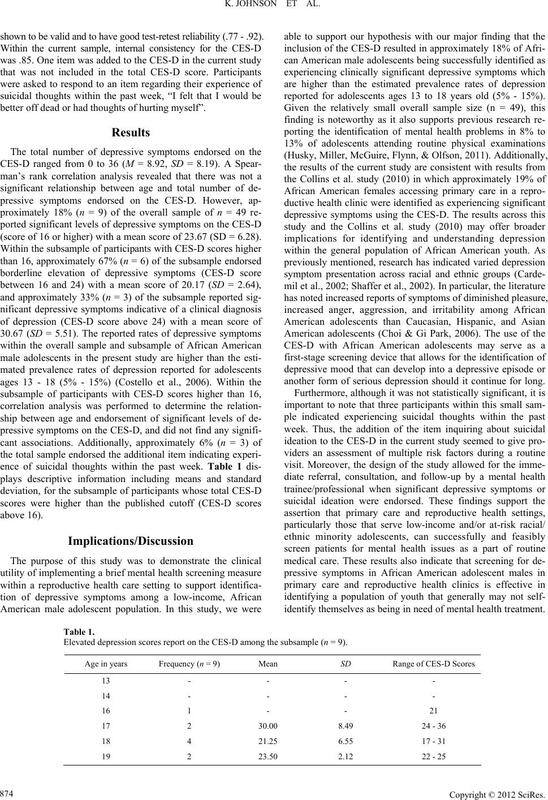 Journal of Adolescent Health, 24, 389-394.
cents. Psychiatric Services, 52, 189-195. Feasibility and acceptability. Pediatrics, 119 , 101-108.